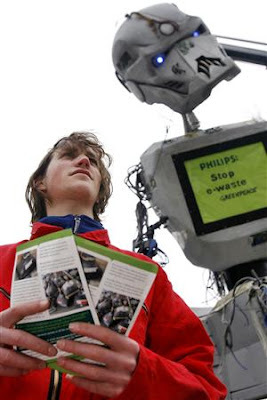 Yesterday activists from the organization protested against the massive amounts of e-waste that Phillips generates. 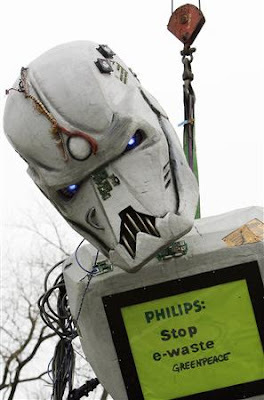 The organizers of the protest placed a twenty six foot robot made entirely of electronic trash directly outside a Phillips shareholder meeting. 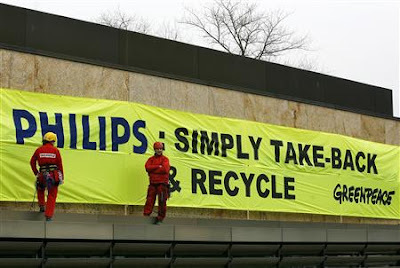 Protesters then climbed a facade of the Amsterdam hotel and posted a massive banner reading "Phillips: Simply Take Back and Recycle." "Philips should take responsibility for its own e-waste," said a Greenpeace spokeswoman in a Reuters interview on Thursday. "Philips has to set up collection systems in all countries where it puts products on the market. In this way, Philips can prevent the e-waste ending up in developing countries." The company quickly responded citing its position as leader in the Dow Jones sustainability index for personal and household goods. 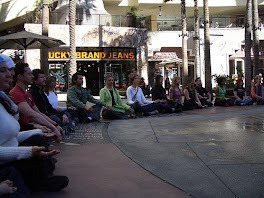 Gerard Kleisterlee, the company's chief executive, responded to the event at the shareholder meeting, simply citing that e-wast was, in their opinion, the "responsibility of consumers and governments." Great...and gas emissions are also only the fault of consumers ? Nothing like a good game of productive finger pointing to end our week, eh? !